I am not Bear Grylls. I have no desire to be. I do not feel at all compelled to battle the elements in bizarre ways, to drink my own urine. Frankly, when I go out for a walk or begin a longer hike, I’m mainly just looking for a way to challenge myself a bit, relax, and enjoy the scenery (and yes, those first two can co-exist!). I don’t mind weather that’s a bit off or scenery that’s not as grand as I’d hoped. I do mind constant rain, cold, and fogged in views from the edges of steep mountainsides that make you lose all perspective — both physical and mental. On that note, I should point out that this post’s title isn’t true: we hiked the popular High Divide (Seven Lakes Basin) trail in Olympic National Park, and while we didn’t complete the loop that meets up with Sol Duc River trail head, we hiked the section of the trail most renowned for its views of Mount Olympus. 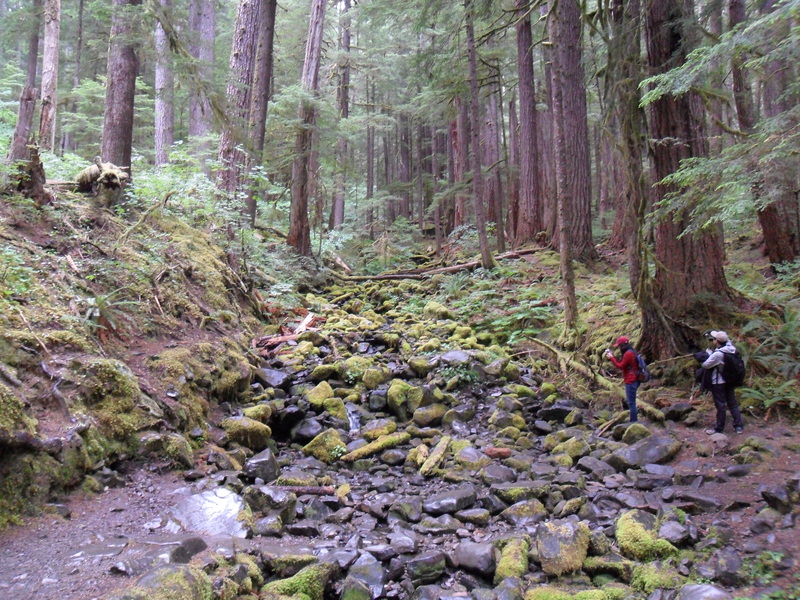 In the 2008 edition of Hiking Olympic National Park (revised just last month), Eric Molvar writes that “views of the Olympus massif expand to fill the entire southern horizon as the path crosses the slopes high above the Hoh River valley.” We saw nothing. Our intended two-night backpack turned into one very long (approx. 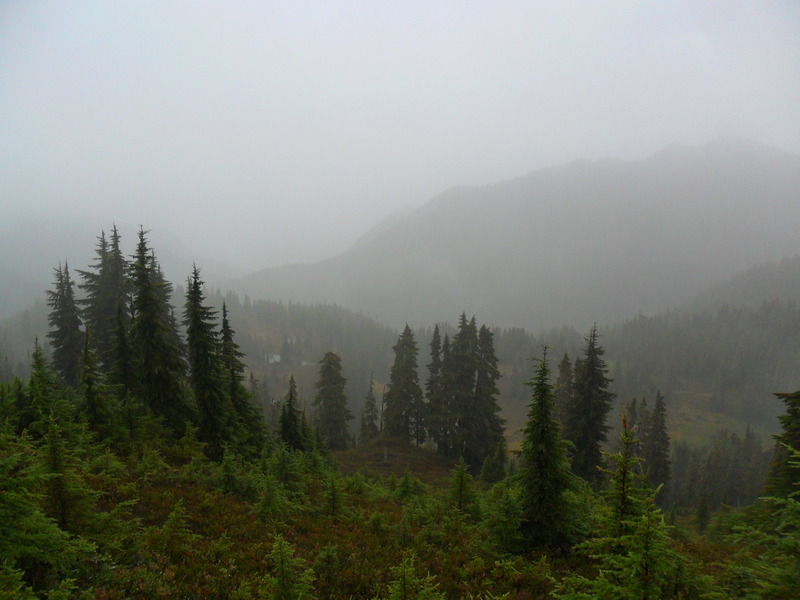 17-mile), very wet and cold, and very disheartening day that landed us back in the same place we’d begun that morning. All that rain does make for pretty cool-looking moss-covered branches. It rained the entire time, and while we had to deal mainly with mist at first, the rain picked up and the air grew colder as we gained elevation (which also happened the entire time). My poncho tore, my pack started to get wet, and my gloves, necessary for my Raynaud’s-ridden hands, were soaked through. Now, hikes can go bad, and when hikes go legitimately wrong, all sorts of real danger can crop up. This hike wasn’t that type of bad, but it was extraordinarily unpleasant. So why’d we keep going as long as we did? Well, for one thing, we thought this backpack would be a highlight of our trip, and we really wanted to try to make it be! Somewhere along the way we overlooked the fact that given the weather forecast, the hike was bound to be a disappointment, either because we’d skip it or be miserable trying. Then there was a lunch run-in with another couple who were camping at Deer Lake, four miles in, who said they’d be camping at Appleton Pass the next night, just as we would be. This kicked into gear my sense of competition as well as trail camaraderie. I thought it’d be fun to meet up with them again. I also thought I’d look weak not to show up. Meanwhile, the couple, from Seattle, had themselves debated whether or not to even attempt the hike, given the weather. But they were doing it! So I could too, right? Some hot ramen also boosted my confidence. As we continued on after lunch, I kept thinking that maybe something would get better, either the weather, how I felt, or the views. Spectacular views can do a lot to keep you going. But nothing got better; in fact, it all got worse. Then I kept thinking that with each step, we were closer to making camp than to the car, so we should keep on. Best view of the day, overlooking the Seven Lakes Basin. Finally, less than a mile from our intended camp, we turned around midway along the Hoh Lake spur, abandoning our plans to camp at the lake, and high-tailed it back the way we came. This bail-out began just before 6:00 pm in the midst of worsening weather, and so we were racing waning daylight, not to mention battling sore knees as we walk-ran down the trail, which was slick from the rain, and singing goofy songs so as not to startle a second bear — or the first bear a second time. 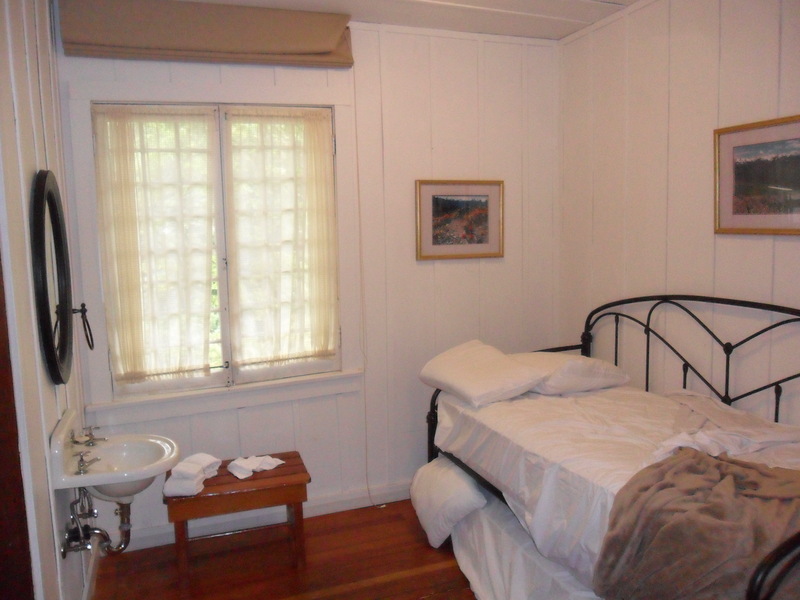 After making it gloriously back to the car, we got lucky and walked into Lake Crescent Lodge, about a 30-minute drive up the road, a little after 9:00 pm to find that they had one room left. 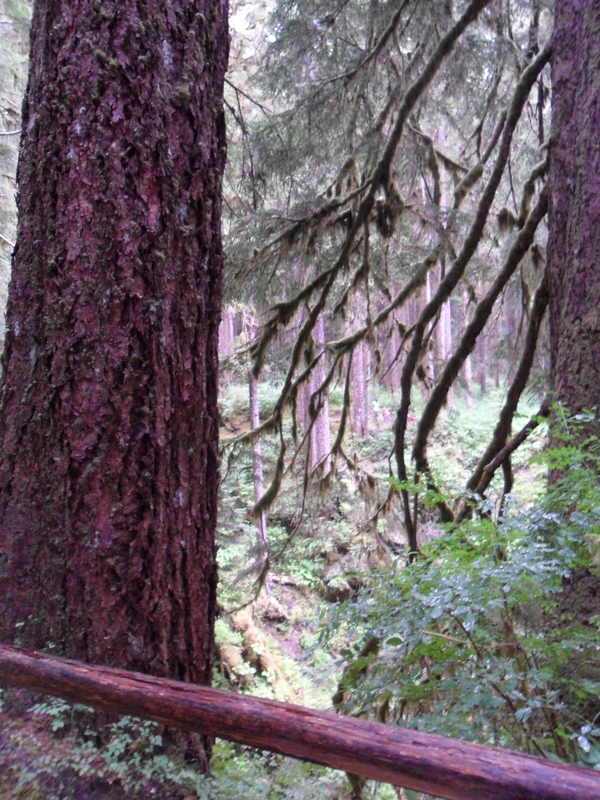 Or, if you do, look for something good in it, like the video view of Sol Duc Falls here, http://youtu.be/ICXPWl5ThpE, and make sure you’re well provisioned or have somewhere dry to stay at the end of the day! Thank goodness for Lake Crescent Lodge!